Review: Monica Wood’s warm memoir depicts love & loss in Maine. 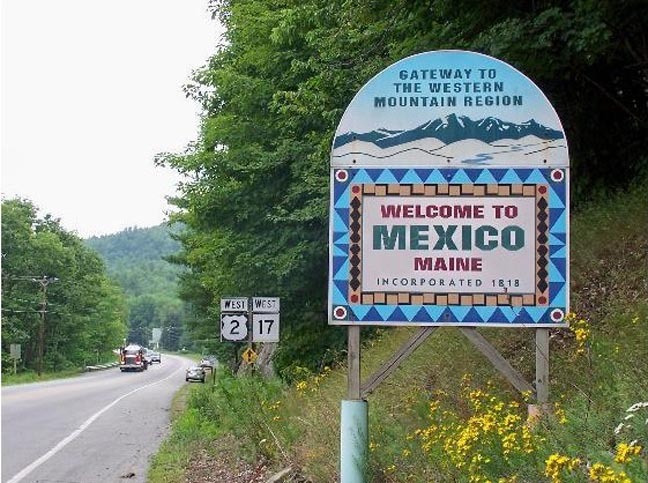 When We Were the Kennedys: A Memoir from Mexico, Maine by Monica Wood. Mariner Books of Houghton Mifflin Harcourt, 231 pp. In her stellar memoir, Monica Wood portrays her family’s quiet woe in the wake of her father’s death and the trauma, a few months later, of JFK’s assassination. Monica was only nine when her oversized, ebullient father fell dead that spring. He was on his way to work at another mighty entity, the Oxford paper mill, the big employer in their tiny Maine town of Mexico. Wood juggles multiple, ongoing stories, including her widowed mother’s shame and depression; her three lively sisters who help Monica cope; her kindly, beloved Uncle Bob, her mother’s brother, a priest devastated and derailed by his brother-in-law’s death; the mill itself, provider of good jobs, sower of deadly toxins, site of increasing strife; friends and neighbors, including the Wood’s odd, immigrant landlords, who are played for humor but who were terrifying to young Monica; her teachers, the loving, eccentric nuns at school; the ripple effect in her large Irish Catholic family of the Kennedy assassination—and especially its effect on her mother; and Wood’s genesis as a writer. A successful novelist before turning to memoir, Wood’s experience shows. She blends her childhood world and point of view with the wiser eye of her adult self. Often we see what her child self cannot—the author’s skill here a delight. Her prose is lovely, rich with details and metaphors. She does a lot with implication, knowing how much to leave unsaid. We were an ordinary family. A mill family, not the stuff of opera. And yet, beginning with the singing boy who found Dad, my memory of that day reverberates down the decades as something close to music. Emotion, sensation, intuition. I see the day—or chips and bits, as if looking through a kaleidoscope—but I also hear it, a faraway composition in the melodious language of grief, a harmonized affair punctuated now and again by an odd, crystalline note fluting up on its own. A knock on the door. A throaty cry. . . .
My mother bursts into song. Or so it seems, on this morning in which nothing is as it seems. Ohhh. My mother sings. Ohhh. “Time for bed,” she says, still sitting. After the heartwreck of the first day, the sustained shock of the news, the ordeal of the wake, she’s composed herself for good and at great cost, and her body when I press myself against it feels like a gently closed door. It’s been thirty-eight and a half hours. Any further tears—thousands, millions, in the years she has remaining of her own brief life—she will shed out of our sight. Another turn of phrase new to me, and it too sounds just right, for we have burst, haven’t we? We lie in pieces that must be pulled together, and Father Bob has to help whether or not he believes he can. He will pull himself together because his big sister reminds him that he must. Wood’s interweaving of her adult knowledge here is deft, but it’s how she deploys young Monica, stunned, struggling to triangulate her loss, that renders the emotional wallop. Her story and her storytelling skill have been recognized. 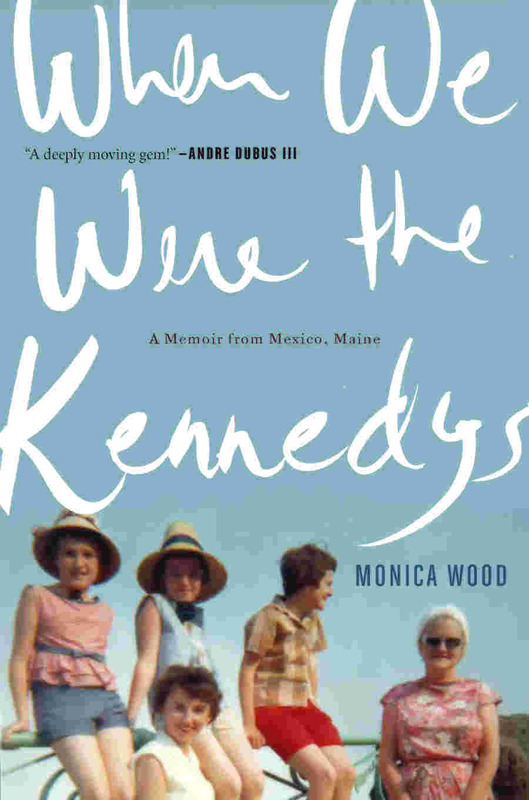 When We Were the Kennedys won the 2012 May Sarton Memoir Award for best memoir by U.S. or Canadian woman and the 2013 Maine Literary Award for memoir, among other honors. This is one of my favorite memoirs. I pressed it on my wife, who pressed it on her four sisters. This Spring I taught it to an honors class of college freshmen; they’re a tough crew—they favor edgy circumstances, and they recoil from middle-aged sensibilities—but they liked it, and a few loved it. Read this post last night, ordered the book on Kindle, stayed up too late reading it. So good (both the post and the book). Thank you. Wow, that’s a fast response. So glad your reading experience is confirming mine, Marsha. It’s a keeper. Thanks for your review, Richard. My own father died when I was young also, about six or so years after Kennedy, but even at that time, father-loss tragedies around the country were still resounding with the emphasis of the Kennedy loss; young widows everywhere consciously or subconsciously compared themselves to Jackie Kennedy, others saw them in that light, that national framework. I will have to tell my mother about this book; I think she will appreciate it. Victoria, you have put your finger on the issue I alluded to: “young widows everywhere consciously or subconsciously compared themselves to Jackie Kennedy, others saw them in that light, that national framework.” Indeed, the effect of the tragedy on Monica’s grieving mother was unforeseen and one of book’s most interesting aspects. I think this is my next book for summer reading of 2015. Her story and mine are very different, but back in 1990 when my father died, I hated hearing people tell me, “You must pull yourself together,” or the best one, “You must pull yourself up by your bootstraps and smile. People don’t want to see you cry!” I can’t imagine saying that to ANYONE, let alone someone who’s just lost their father! I wasn’t a child either. I was forty-five! I digress. I think Monica’s story has such great merit and a sense of a family trying to look pulled together as they walk through calling hours, the funeral service, the casserole-bearing-well-meaning days and beyond. Will enjoy her memoir and learn from her. Your post and her book have my undivided attention this morning. Thank you for reading and commenting, Judy. The idea of sparing others the distress of seeing your grief seems rather monstrous. Our culture really denies the existence and reality of death. Just ordered (another for my Richard Gilbert suggestions bookshelves!) My own father died in November one year after JFK’s assassination. Up until a few years ago, I had to refer back to my dad’s printed obit to clear my head as to which one died in which year. It was a real tangle in my pre-teen head, and I conflated the two events for many years. I know that issue! I hope you like the book—I predict so.